Every night during Lent I take part in one of my favorite parts of this holy season. It is the Catholic tradition of praying the stations of the cross. As I privately walk the stations, I use Every man’s way of the cross, the booklet that’s been used at St. Charles for years and years. I’ve used others here and there but this is my favorite. Walking the stations reminds us that we are on a journey. The starting place is sin. The end is eternal life. The way from the start to the end is Christ. Christ is there with us at the start, remains with us on the way, and will be with us in the Heaven if we make it there. As I read these verses, I thought of the stations. As Baruch says, when we walk the way of God, we come to that place of peace, wisdom, strength, understanding, life, light, and eternity! 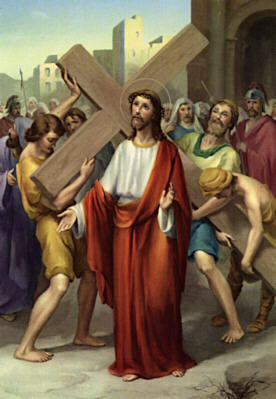 When we walk and pray the stations, we walk the very way of God–the way of the cross. He is our companion on the way, he is the one who makes it possible to make the journey in the first place, and he is our destination! The way of the cross is the way to the peace which comes only from God. This entry was posted in Bible, Confession, Lent, Prayer, Reflections. Bookmark the permalink.